Steele Street Trading Co and Gallery is home of Steele Street Floral. We are a full service florist specializing in non- traditional floral designs for any occasion and voted Best of Kewaunee County 2017. Our inventory of exotic plants is the best in the area. 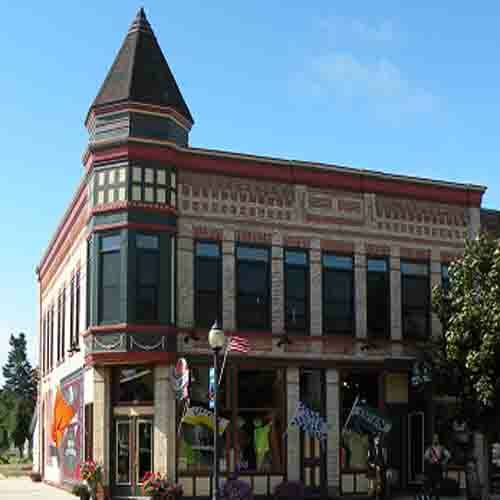 Our historic 1894 Melchoir building is nestled on the corner of Steele Street and Third Street in historic downtown Algoma, Wisconsin at the base of the Door Peninsula. The gallery space is filled with the work of local artists and gifts inspired by water. We also carry Local Raw Honey, Indulgence Chocolate, Backroads Gourmet Coffee, BOS Mead, and Algoma Souvenirs. *Our shop is open from 9:00 a.m. to 6:00 p.m., Monday through Friday, from 9:00 a.m. to 4:00 p.m. on Saturday and by appointment on Sunday. If you have any questions or need more information, please call us directly at (920)487-3840. We're always here to serve you and make your flower-sending experience a pleasure.